While we celebrate the past, we also never stop looking for ways to improve. 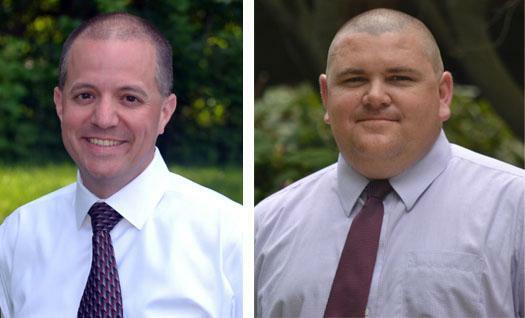 We are excited to announce the promotion of Keith J. Marshall, PE, and Nicholas P. Rakowski, PE, to principal. Keith has been heading up our Civil Department and will continue to do so, but will now play a bigger role in the strategic direction of the company. Having recently led the Nave Newell team on the King of Prussia Mall Expansion and Villanova University projects, the promotion to principal is well-deserved. Nick has proven his ability to be a strong leader overseeing some of the company’s most challenging land development projects, including the Great Valley Corporate Center Redevelopment and Saint-Gobain North American Headquarters. He has also been assisting Keith in managing the Civil Department over the last few years. Nick has become a mentor to so many and it became obvious that part of his new role as principal will be to take on an ambitious challenge – the creation of Nave Newell University. “We are excited about the significant investment we are making in this training program that complements our culture of continuous improvement. Teaching both technical and managerial skills, Nave Newell University will enhance the level of service our clients receive and allow us to attract top professionals that are interested in career growth and development,” said Greg Newell. Keith and Nick join Nave Newell’s other principals, Paul Lepard and Tim Brennan. Paul formed the company’s land planning department, which he has grown to include five talented design professionals. They collaborate closely with our engineers to offer creative solutions for planning and landscape architecture. Tim’s ability to expertly manage relationships with both new and existing clients over the last 12 years has been evident in the firm’s long-term client base and growth. Together, along with Greg Newell and the director of operations, Sherri Daugherty, the four principals will guide and shape Nave Newell to be successful for the next 25 years.